One word to describe these, delicious! A wonderful crisp texture on the outside and chewy on the inside. The flavor of the toffee bits covered with chocolate is scrumptious. Let's face it, how many chocolate chip cookies can you eat? We need variety in our lives, so I was silently on the hunt for a new cookie recipe and got this one from my sister. I'm not really sure where she's been hiding this one as I thought she got all her recipes from me.....haha! She just happened to mention to me that a friend had asked her if she was making "those" cookies that she makes for her husband's poker night. I thought, if someone was requesting "those" cookies, I want that recipe. Give it to me. She did and my husband told me they were hands down the best cookies I have ever made. Sift together the flour, salt, and baking soda. Set aside. In a separate bowl, combine Heath Bar pieces and chopped walnuts. Set aside. Beat together the butter and sugar until well blended and than beat in eggs one at a time, add vanilla. Alternatively mix in the Heath Bar mixture and the flour mixture until all are blended. 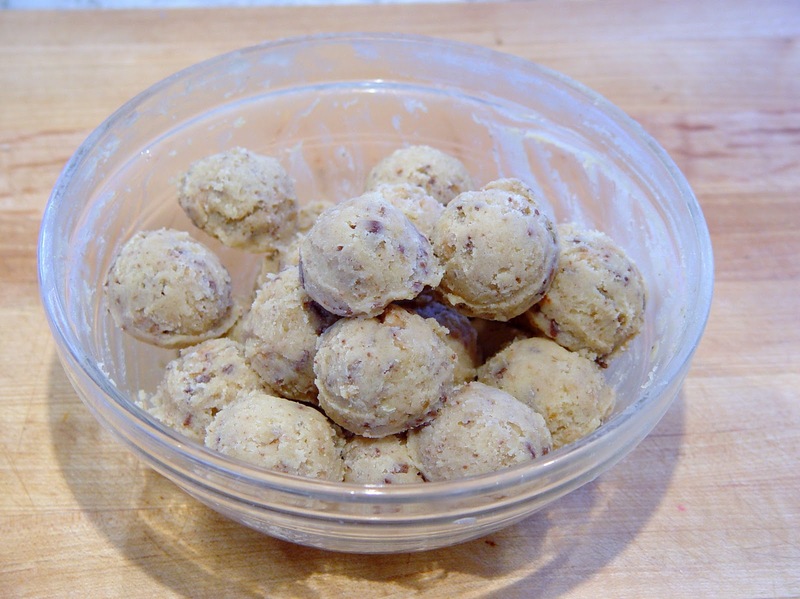 Chill cookie dough for at least 30 minutes or up to 24 hours. Preheat oven to 350 degrees. 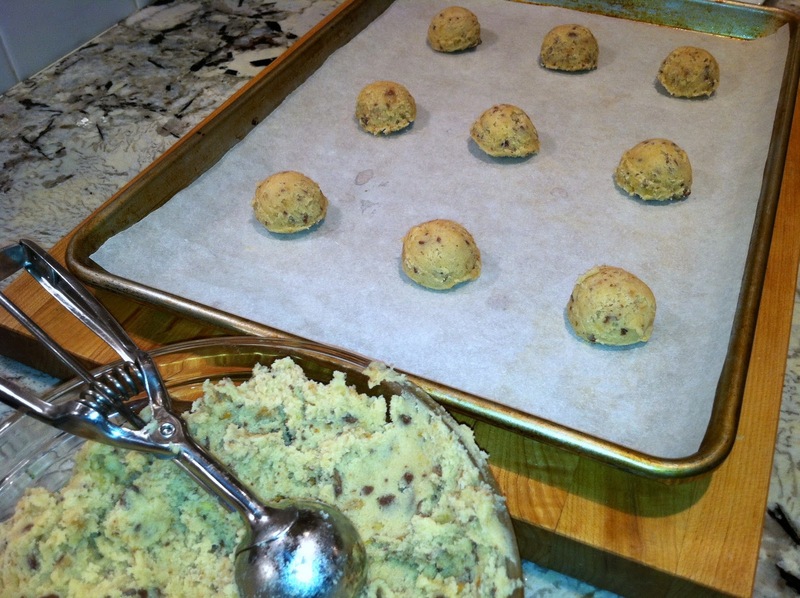 Line a cookie sheet and use a 1-inch melon scoop to make balls from the dough. Place 3 inches apart on cookie sheet. These cookies spread so leave plenty of room. Bake for 12-14 minutes, until the edges are just starting to brown. Remove from the oven and let cool completely on a wire rack. I could have fit another row but be sure to leave plenty of room. These cookies spread. After the first batch is in the oven, I get the cookie balls ready to make it faster. 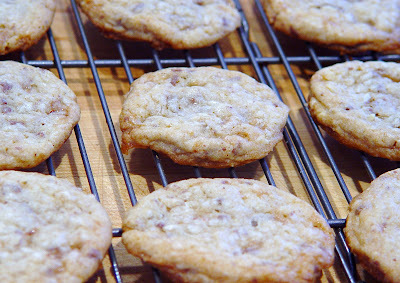 Heath Bar Cookies hot out of the oven! This is truly a fun and informative cookie recipe. 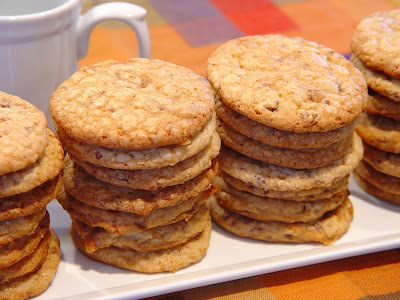 These cookies have an outstanding textures, intriguing flavors, and made from finest ingredients. Thanks a lot.